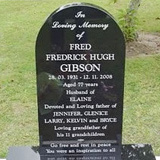 Grahams Memorial Headstones carries a variety of granite headstones and bases in different shapes and colours at our showroom and stockroom at Grahams Funeral Home, West Street, Tuakau. 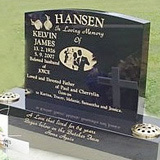 If we don’t have a preferred headstone colour or design, we can arrange for the memorial to be custom made overseas. This will take about 12 weeks from date of ordering. If you have a headstone or memorial design or idea in mind, come and talk to us and we will work with you to bring your concepts to an achievable, meaningful result. 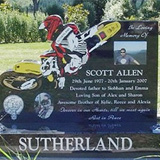 Once the headstone design is finalized then together we can create a layout of how the inscription, artwork and photos can best be crafted on the granite. This phase is important to ensure that, wherever possible, your headstone expectations can be met and if not, any modifications are realistic and acceptable to you and for us to create the everlasting memorial. Only after you are satisfied and sign off the headstone layout, will work commence on the memorial. We will discuss lettering size, fonts, spacing and room to be left for future details (if applicable). Ivo Solleder, our Monumental Mason at Grahams Memorial Headstones is highly skilled at converting or drawing a photographic image into a format that can successfully be cut into granite for maximum visual effect. He will strive to achieve the best headstone or memorial for you. • Accessories chosen; e.g ceramic photos, vases, bronze cross, statuettes etc. 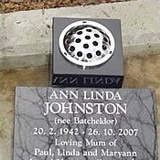 • Ease or difficulty of installation of the headstone or memorial. e.g. Berm or no berm, slope of the land. on a Splayed Front Granite base. Ceramic Photos and Coloured Artwork.